Meet Carlos Salazar, Our New Mobile Marketing Manager! There’s another new face in our expanding Manila office. Carlos Salazar recently joined the team as Mobile Marketing Manager. “I’m here to help the team and rise up to all the challenges that come up day-to-day to support our whole network”, Carlos explains. 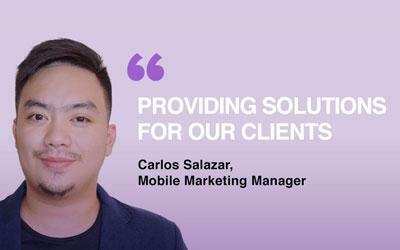 28 years old and a graduate of Computer Engineering, Carlos has been in the Mobile Marketing field for almost 4 years now. He spent this time at another player from the industry where he handled various responsibilities, both on the advertiser and on the supply side, and finally as a Senior Account Manager. “I know how to manage issues to the benefit of clients and help optimize the performance of our company at the same time”, Carlos says. He’s been with Spyke Media since February, so he’s still learning. Some things are different, like parts of the platform our company works on. But the overall logics of the market are the same. “It’s also easy for me to adjust because our Manila team is very friendly and the German guys feel very close, although they’re geographically far away.” As a matter of fact, Carlos had known some of the Manila colleagues before he joined Spyke, which was helpful for him as he decided to take that step to a foreign company. Here, Alina Dobrzinsky is the person he works with and reports to most of the time. “As a Mobile Marketing Manager, I have a challenging job”, Carlos says, and he feels happy about this. Understanding developments and shifts in the market, looking at the successful examples of app marketing is what he enjoys. “I’m looking for and providing solutions for clients – ideally achieving win-win outcomes. Communication is a key part of his position, and he’s in touch constantly with people in Europa, Latin America, Asia and more. In his free time he’s a family person. He likes to spend the time away from the office with his close relatives and goes to church with them on Sundays. When he’s just hanging around to relax, he enjoys watching Netflix series, specifically documentaries – and he’s looking forward to watching Season 2 of Kingdom.